The first ever image of a planet outside our Solar System: the European Southern Observatory's VLT (Very Large Telescope) captured this image of a Brown Dwarf star (center) and it planetary companion. The Paranal Observatory's 8.2 meter VLT (click for press photos and information) created this image out of a composite of three near-infrared exposures. 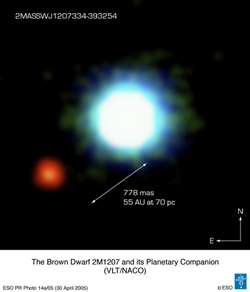 A brown dwarf is not a full-fledged star, but does emit strongly in the near-IR. A planet does not generate heat like a star or Brown Dwarf so IR imaging is required. To me, nothing is more exciting in the world of Astronomy than the detection of exoplanets. Using incredible technology, we are able to detect a planets affect on a star - either indirectly or directly - in order to determine not only the presence of an orbiting planet, but also the size of the orbit, orbital velocity and planet mass. By using some of the fundamental mathematics used in other aspects of astronomy, we are able to apply this knowledge to the study of exoplanets. Both these terms are the same, describing a planet or planetary system in orbit around any star other than our Sun. This site will break down the basic methods of detection used by both amateurs and professionals. An excellent introduction is my very own project paper on exoplanet detection. The goal of this section is to outline my progress in my very own (soon-to-be) project of planet searching. The other subsections provide resources to learn more.